The Shrieking Violet 'zine is five, and will be celebrating with a mini-birthday party at Castlefield Gallery on Thursday August 14 (turn up and drink cocktails, eat cake and look at the current exhibition as part of the gallery's one-off late-night opening) from 6-9.30pm. North West-based designer and curator Robert Carter, who contributed the cover design, has work on display in Castlefield's current exhibition, I Would Like to Join a Club and Hit Myself With It, until Sunday August 17. 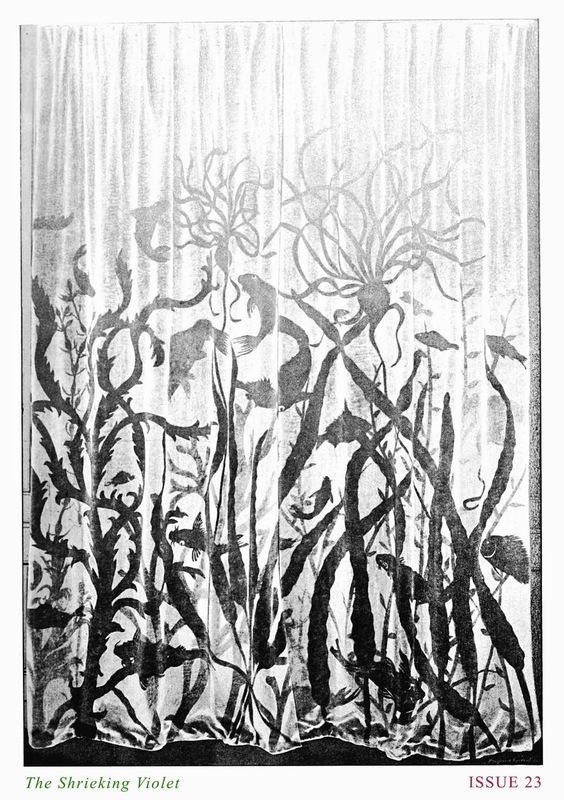 The image, by an unknown artist (though possibly a member of La Libre Esthétique, an artistic society formed in 1893 in Belgium), is taken from the periodical Arte et décoration, Volumes 1-2, 1897, encountered whilst undertaking research for the Exhibition Centre for the Life and Abuse of Books' upcoming exhibition Butterworth at the Anthony Burgess Centre (opening on Thursday August 14). Robert has worked with a number of artist-led projects, including Auto Italia South East (London), Malgras|Naudet and Lionel Dobie Project (both Manchester). He was editor of the kuboaa publication from 2011-2012 and is currently co-curating a pilot programme at The Exhibition Centre for the Life and Use of Books with Daniel Fogarty and Lauren Velvick. Robert and fellow Manchester artist Monty, who also has work in I Would Like To Join a Club and Hit Myself With It, also contribute 'A structure for standing' (2012), a drawing of a wall structure Robert made for an exhibition that he then got another artist to draw on in situ – a still life of an exhibition. Claire Hignett explores the story of a group of 1930s Basque children in Salford. Claire is an artist interested in the transience and accumulation of memory, using textiles as a means to express the erosion and piecing together of memory and its beautiful fragility. She is particularly intrigued by the way we attach memory to objects, creating souvenirs of our past. Stumbling on the story of the Basque children has sparked an interest in the period between the wars, which she intends to mine for her own creative projects on memory. She earns her living as a community artist and facilitator. Stephen Marland documents some of the varied former Co-operative premises of Greater Manchester, many of which have found new and diverse uses. Stephen was a van lad, BR goods guard, gardener, taught photography for thirty years and took early retirement in order to explore the world on his bicycle. He also takes pictures. Stephen is interested in almost everything and has recently started a blog dedicated to bus stops in Greater Manchester and beyond. Adrian Slatcher, who has poetry and fiction in the Rialto, Sculpted: Poetry of the North West and Unthology 4, delves into the secret history of the synthesiser. Adrian blogs at artoffiction.blogspot.com and makes electronic music as Bonbon Experiment. Artist Jade Montserrat explores art and gender with reference to the recent AGender conference in Leeds. Jade is currently based at Islington Mill, Salford, where she is continuing to research and develop work issuing from a project called 'Josephine and The Rainbow Tribe'. Her practice includes printmaking, books, performance, writing, sculptural objects and installations, which are generated through the merging of opposite processes, both revealing and concealing information. Rob Jackson, a cartoonist from Bolton, takes a trip to Fleetwood, Lancashire. Rob, whose day job is making and selling home-made ice cream, has also self-published a lot of comics over the years. Kyle Baddeley-Read, who used to live in Manchester but now lives in Norwich, contributes his latest comic. Kyle spent a few years writing and drawing the absurdist comic saga Silent V, and is now co-editor of the sci-fi anthology RhiZome. This issue also features poetry by Kenn Taylor, a writer and journalist from Merseyside who now lives in Yorkshire. He has a particular interest in the relationship between community, culture and the urban environment. Manchester-based filmmaker and musician Richard Howe continues his series on mental health in the movies with 12 Monkeys by Terry Gilliam. Richard is currently co-editing the films ‘Realitease’, and ‘The Were Squirrel’. Tweet him about films @rikurichard and watch short films about a variety of things at http://www.youtube.com/channel/UC1tCl13aUbRbNSatyCAKNOw and https://www.youtube.com/watch?v=28W8muNaik0. Steve Connor, co-founder and CEO of Creative Concern, contributes a summer recipe for satay tofu and aubergine skewers. Steve does a lot of writing and brand-related work and helps make campaigns happen for organisations working on sustainability, climate change, regeneration, culture and a whole bunch of other issues, together with a talented team of 20-plus people at Creative Concern and with a host of other gifted people across England and the rest of the world.